Phil Zwijsen's at it again! Featuring Joe Gavin, Snowy, Jethro Coldwell, Ash Hall, Stanners and the rest of the gang. With Flo Mirtain, Adrien Coillard and the rest of the Josimards crew. Dropping April 2016. A brand new section from our favorite Swedish mosher. With Juan Saavedra, Santiago Sasson, Gregoire Cuadrado and more! 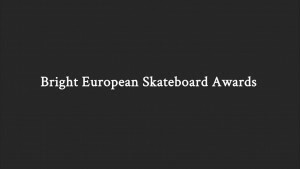 2016 Bright European Skateboard Awards – VOTE NOW! Vote now for the European Skater Of The Year, Rookie Of The Year, Video Of The Year, Brand Of The Year and Shop Of The Year.